Hair Detox by Angelo David is a doctor-formulated herbal supplement for both women and men that obtains critical nutrients to help detoxify the body from the inside out, restoring the ability to naturally grow fuller and healthier hair while preventing hair thinning and loss. Unlike other hair loss solutions, Hair Detox is the only all-natural supplement which combats all factors through its all-natural ingredients. Besides stimulating hair growth, Hair Detox by Angelo David also assists the body in balancing the effects of environmental toxins, stress and hormone imbalances, all of which are major factors in hair thinning and overall loss. In addition to overcoming hair loss and its contributing factors, Hair Detox by Angelo David also works to improve clear skin and strong nails. A compound derived from plants, saw palmetto is an herb that inhibits 5-alpha-reductase, an enzyme containing DHT that is believed to be a major factor in hair loss. By inhibiting this enzyme, saw palmetto targets symptoms of excess testosterone, including hair loss. Biotin, a natural B-vitamin, has been shown to improve the hair quality of patients with certain disorders. A B-vitamin needed for specific enzyme activity in humans, biotin deficiency is associated with symptoms like hair loss, dermatitis and more. Biotin deficiency may also be related to diet, drug interactions and increased vitamin need in smokers or pregnant women. A nutritious plant historically used as medicine, food and even garment making, stinging nettle’s root, leaves and seeds serve as building blocks for healthy skin, hair, nails, and bones. Both internal and topical applications of nettles have been used to improve chronic skin conditions and treat tonic hair. Additionally, stinging nettle root may also block the action of 5-alpha-reductase to reduce the effects of excess testosterone in the body. Found in evergreen trees in southern and central Africa, pygeum africanum bark helps control the activity of 5-alpha-reductase, the testosterone-producing enzyme. When combined with stinging nettle, pygeum africanum bark can help balance the ratio of testosterone and estrogen in the body. As excess testosterone promotes hair loss, the altercation of this enzyme thanks to pygeum africanum bark may help promote hair growth. By offering a concentrated source of minerals horsetail is beneficial for skin, hair, nails, bones, and connective tissue. Silica, a key mineral in horsetail, is an important component of the outer shaft of hair, as its presence will reduce hair loss and exhibit an overall healthy luster. A polyunsaturated fatty acid, Gamma Linolenic Acid helps stimulate growth of the hair and skin, along with maintaining bone health. An ingredient derived from vegetables, DIM plays a key role in estrogen metabolism, potentially causing a beneficial shift in the balance of estrogen, testosterone and progesterone. Calcium-D is a glucarate that comes from a natural substance found in fruits and vegetables that supports detoxification, ultimately providing a defense mechanism for eliminating cancer-causing toxins. Additionally, Calcium-D is essential in regulating estrogen metabolism. A common dietary supplement, green tea is essential to support detoxification. Because it remains untouched after harvesting, the active components of the herb remain the same as during cultivation. Derived from the spice turmeric, curcumin helps the body handle excess free radicals from exposure to toxins while supporting detoxification. Because of its many uses in the body, Zinc is beneficial for hair health as it assists cells in reproduction and aids in the production of keratin and protein which makes up hair. Zinc also maintains proper oil secretion from glands on the scalp, which overall helps the strength of hair follicles. An essential amino acid, methionine is present in hair follicles and protects against damage from aging environmental insult, ultimately maintaining the viability and growth of hair follicles. HAIR DETOX PROGRAM: To achieve optimal results, Hair Detox should be taken as a part of the Hair Detox Program. 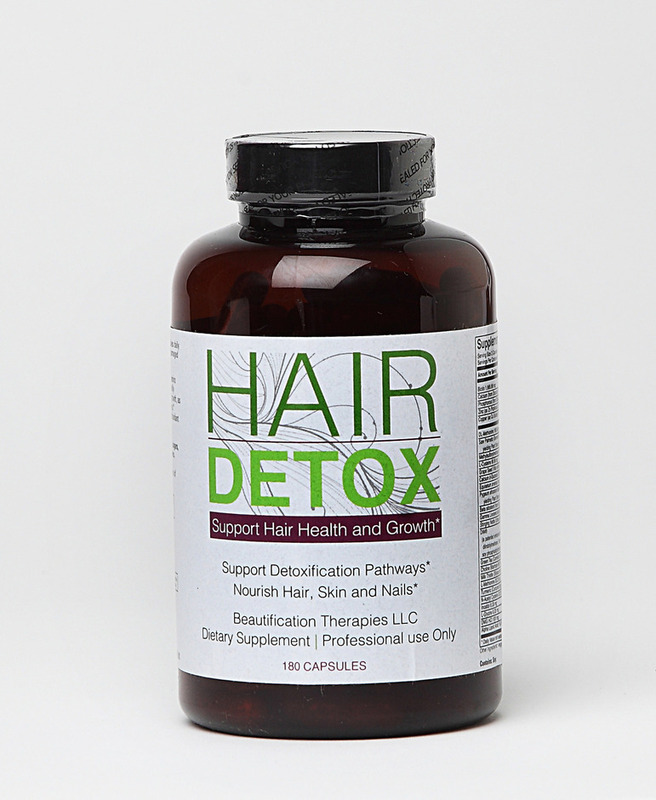 For a full Detox Program, Hair Detox should be taken for 90-days at the recommended dosage amounts of 2-6 capsules per day, depending on desired results. In conjunction with The Hair Detox Program, clients are advised to adhere to the Hair Detox 21-28 Day Diet by eliminating foods that are known to cause allergies and chronic internal inflammation. SALON: At Angelo David Salon, anyone can have the hair that he or she always wanted—completely customized for desired volume, length, color and image. As the innovator of Couture Hair™ Extensions & Additions, Angelo David is the only salon that can address any hair challenge with the finest solutions in the world. A beauty industry veteran, Angelo David Pisacreta is the owner and Creative Director of Angelo David Salon. He is a world-renowned stylist and colorist, as well as the originator of Couture Hair Extensions and Additions and developer of The Angelo David Hair Care collection. By pairing his impeccable designing skills with artistic cutting, coloring and styling abilities, Angelo has transformed even the most challenging hair into lust-worthy locks.